Freddie was born in hospital and was always going to be. His labour and birth was a planned hospital birth. If you are ghoulishly looking for anti h-ome-bi-rth evidence, you are in the wrong place. Notice as of May 21st 2012: Please note, permission is not given to cite or copy any element of thi story without consent. In addition, Freddie’s story may not be used to illustrate points on websites which condemn midwifery or VBAC or babies who arrive in their family house/early labour at home. Any use of the content for the above is an explicit infringement of copyright and will be reported to Google as such. 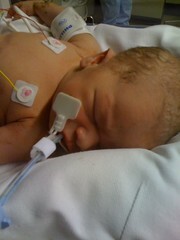 Freddie was born in the UK and his arrival plan was in accordance with current NHS NICE guidelines and best practice. Freddie’s death certificate does not cite this part of his life as cause of inability to remain living. If you are unable to comprehend the following story in terms of the above, feel free to read my further statement on the subject. If you have come here in search of ghoulish evidence for why normal childbirth is dangerous, you are not welcome here. This is the story of Freddie’s birth, one of the most amazing experiences of my life. It is also, sadly, the story of the first of his 11 days of life. His birth was, I believe, a successful planned hospital VBA3C. You have to decide for yourself whether successful is the right word. I was always worried about Freddie. I put the differences in the pregnancy down to him being my first boy but I’m not convinced that was what it was. I didn’t prepare for him coming in any way other than to knit him a blanket, secretly trying to ignore the fear that he would only use it in death. I can’t explain that feeling but I know it was there, that I felt it strongly and that I told people how I felt. There was nothing medical to explain it but I suspect, had I had a scan, we might have discovered that there was not enough water around him and that perhaps that was masked by my own size. I’ll never know. On the Wednesday, I had a morning of light labour like pains. I knew it wasn’t “it” but I thought it was perhaps getting ready. I’d had no braxton hicks at all with him, most unusual, but for the first time, I had a slightly engaged baby. They wore off that afternoon and from then on and all through the next day he was very quiet and apparently sleeping. Not enough to make me panic but I felt he must be tired from the practice and getting ready. Now, I think he must have been becoming troubled. I so wish I had gone for reassurance but my midwife had come on the Wednesday and he had been fine then. On the Thursday night I felt myself becoming very hormonal and suddenly cried, saying to Max that I wanted him out and that he didn’t feel safe. I had quite a vivid impression of him in someone else’s arms and having to be cared for. I talked at dinner, to the girls, of how not all babies come home. That night, I texted Shona, my doula, who went to bed, knowing she’d be called soon. I sat up till late, trying to finish the crochet on the back of the blanket before realising about about 12.30am that I ought to get some sleep. I was pleased to have got passed April 1st anyway. A few hours later I woke up, slightly unsure as to why. I felt something odd, tried to work out what it was, lay there for a minute, felt another pain and realised it was a contraction. My immediate slightly befuddled thought was “Oh no, I’m logged in to BeadMerrily, not MuddlePuddle, he’ll be born in the wrong blog!” and then I woke up a bit more. Got out of bed, realised my waters had broken, went to the loo to check them. There was hardly anything and no show, but I put in a pad and they seemed clear. I had a moment of two of wondering if there was a smudge of green but concluded it was mucous. By the time I got to the loo downstairs to avoid bothering Max, I was shaking frantically and sat on the toilet (having a traditional clearout!) for a while, absolutely shaking to my core. After a while I pulled myself together, ate a banana and had some water, texted Shona to tell her, then again to say she should perhaps come. I told Max but suggested he continue to sleep, lit a candle and pootled about going to the loo, getting birth ball and stuff together and waiting. It was a nice time. I was calm, the baby was shifting down each time I went to the loo and nothing was scaring me. The waters were not messy, nothing like Josie, but the bits I saw were clear. Nothing to worry about. When Shona arrived we made ourselves comfy in the living room and chatted. I did get a bit nervous that he seemed still at one point and checked his heartbeat. It was pretty much identical to every other time, through a contraction and I knew the same as all my others had been in labour. Shona kept feeding me bananas and we giggled as I seemed to have an extra strong contraction every time I had a bite. She kept me going on water and bits and bobs. Later she referred to this time as “when we were waiting for him” – and that is such a lovely way to remember it. It was just perfect, like the births I had read about and never dreamt of experiencing. I’d imagined something would go wrong and so far the only thing outside my comfort zone was my waters breaking. But with no mess, no meconium and an engaged and ever lower head, I felt safe. I don’t remember much more than that except that first Fran, then Amelie woke up. I put them in bed with Max but came to the conclusion eventually that I was doing childcare and he needed to get up and get them packed off to Auntie Sue. I can’t remember the timings but they were perhaps gone by 7.30; I spoke to Sue, still very much together but once they’d gone it all cracked on a bit. I was glad when Max got back. We sat about together for a while and Max offered me a bacon sandwich (NO!) but I ate lots more banana. He looked so relaxed, Shona was doing a brilliant job; it was one of the nicest few hours of my life. I rocked over a birth ball with a duvet on it and I was so comfortable. I don’t recall having an impression of the baby moving, but none of the others have either. I knew when he was moving downwards, I knew he was doing that. I don’t remember him kicking but not having had a normal easygoing labour of that sort before, I have no idea if that was typical. I don’t remember Maddy moving much either. Some time before 9, I knew a car journey was going to get unpleasant before long, so I said I wanted to go. We phoned the hospital and I spoke to the (lovely) midwife a bit cagily as I was worried they’d hit me with endless vbac horror stories and find an excuse for theatre. She asked me if I’d get there safely as it was my 5th – I laughed, just, and said yes, i thought so. I insisted on bringing the blanket and I remember having a moment of panic at bringing the car seat, like it was tempting fate and I do know that when Max dropped us off, I went on about the blanket, biting back “in case he dies” – I wanted to say it so much, but it seemed ridiculously melodramatic. The car journey, with hypo cd in the background, was pretty tough. I had to kneel in the car middle and it seemed to take a long time. I felt every bump! I had a couple of moments of thinking “nooo, don’t come now!” and was very glad when I felt us going round (and it felt like round and round and round) the roundabout above the hospital. Max dropped us at the door and Shona and I managed to negotiate the rotating door, not noticing the easy open one to one side. It was Good Friday, deserted, which seemed a good thing at the time. I spent a fair bit of time leaning on the desk, on pillars and shuffling along; the walk to the delivery ward seemed to take forever. I think we got there before Max, I can’t remember. The midwife we had, Debbie, was wonderful. She let me settle, go to the loo and relax and then asked if she could examine me (2-3cm which for the first time ever didn’t worry me) and monitored me. Everything was fine. My legs were incredibly sore and puffy and kneeling was just so hard but sitting didn’t appeal. I draped over a ball for the monitoring, leaned against Max, Shona rubbed my back and talked pool labours and births with Debbie. Pool labour, which I hadn’t even contemplated, seemed perfect, pool birth didn’t appeal. Once the monitoring was done, perhaps about 10ish, I got in the pool and just completely relaxed. Shona was on water duty and kept feeding me, Debbie pottered about and kept out of the way and Max got more involved sitting with me. I remember saying to him “whatever happens next, this is still the best it has ever been” – words to remember. Quite soon, I needed gas and air; I didn’t know but once in the pool I was contracting 1 in 2 and it was so, so hard. I could feel him moving down and my bump felt so tight. I remember putting my hands on him and feeling only baby shape. I wasn’t aware of any fluid leaving me but had it been coloured, they would have seen. I floated on my front, supporting myself on a ledge and muttered drunkenly about various things, including something to do with it being the “mermaid birth position”. Debbie monitored me. Around 11.30 she said she had heard a deceleration and asked me to get out. I said I couldn’t, she said I had to and I heard her voice change and just did. Once out, I remember her saying actually it was all fine and seem to remember her suggesting I could go back in, but I was on the edge of the lovely low foam couch, leaning against Shona and with Max helping me with the gas and air and I really didn’t want to. There was absolutely no break between contractions at all, I found it almost a relief not to get relief; it was constant and there was no time to dread them. I was completely in on myself by then, I don’t remember anything else but the odd second. A whole other midwife was there but i don’t remember her. I don’t recall the monitor, I don’t recall being examined and being 8cm. My body and the baby had taken over. I remember gesturing to Shona to move closer, I remember pulling the mouth piece from the gas and growling at Max. I know I made noises but I don’t think it was more than groaning into the gas. I don’t recall any panic, ever. I know Debbie called for a double check as she felt my heart beat and his were close together and wanted to have a second opinion. A consultant came in and checked them and signed all the monitoring but if they were concerned about anything, it was me, not baby. He stayed about as he was the person who had cared for me. I remember him taking my pulse as a double check. They never seemed anxious, they were just being extra careful. I remember him saying perhaps they’d put on a scalp monitor to be sure but that they were pretty happy really. There was no very slow heartbeat at any time, just two quite quick ones. I remember grunting and shaking my head as I knew Freddie was on his way out and as the consultant reached down with the clip he said (as happened with Maddy) “Oh!” The midwife told me afterwards that the consultant went to get up so she could catch him and she laughed and gestured to him to do it, so clearly there was no panic then. I don’t remember needing to push, it was like my body and the baby knew exactly what to do. I don’t remember any sense of effort or pain, just extreme sensation. His head was out and then in an easy, simple slither, he shot out on to the floor, completely straight. And I took one look at him and said “Oh my god, he’s going to die” and I turned my head away. And I said it over and over again while we waited for him to breathe. Suddenly everyone else seemed to realise he wasn’t going to gasp and the room filled with people. I remember Shona trying to reassure me at the sound of a whimper on the resuss table and me knowing it wasn’t enough. I remember Max holding me from behind, his arms locked around my shoulders. I remember Debbie’s hand in front of me as the placenta came away and my injection and knowing I didn’t need stitches. I remember thinking “Give him to me, give him to me; if he feels me he’ll be okay” and knowing there was no point saying it because it wasn’t true. I remember knowing he as an okay colour, not livid, not white but definitely dusky and not interested in trying to fight. I remember them telling me his heartbeat was good, (Apgar was 3 and 4) and not to panic. I remember the consultant taking cord bloods and disappearing with them. 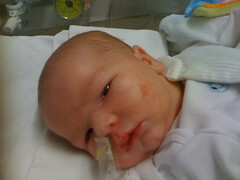 And then they took him away to SCBU, where he died 11 days later. And it had all gone horribly, horribly wrong. As I had known it would. And we are never going to know why. He certainly had brain damage and his cord bloods were catastrophically low but they didn’t really add up to a cord accident, more a slow descent into trauma. He doesn’t appear to make sense to any of the people who cared for him. His life is probably for another day, another post, but in the end all they could really come up with was that yes, his brain was starved of oxygen over a period of time, not acutely. He fitted after birth, yet his heartbeat was always good. He was breathing unaided after 12 hours but there always seemed to be something stopping him doing quite as they expected. I never really felt he was heading for Cerebral Palsy, I felt there was something we couldn’t see, something making him fundamentally weak. I was asking them to consider how we might have to let him die when they thought we’d be taking home a disabled child. And then, out of nowhere, as he seemed to be getting better, suddenly he was seriously ill with a chest infection and then gone. Whatever else, I think I had good instincts about him all the way through and I can’t make myself see how a 3 hour established labour easy birth can have killed him. What I will never know, what is really cruel, is I don’t know whether he would be alive if I’d had my ‘easy option’ elective section a week earlier. That is very hard. I’ve been told that had that been my first labour, there would have been no question of anything but a natural delivery – but he wasn’t my first and I had a choice. And maybe, I don’t know, maybe I made the wrong choice. I just don’t know. I don’t think so but I can’t ever know. Darling Boy at 9 days old.